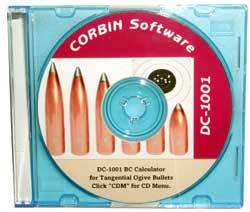 The DC-1001 BC Calculator program helps you design tangential ogive (spitzer) bullets with flat, dish, cup, hollow, boattail, or rebated boattail bases, with or without jackets. The program instantly calculates the BC (Ballistic Coefficient), Ingall's number (form factor), sectional density, minimum stable twist rate, bullet overall length, shank length, base length, and ogive length, as well as the average bullet density, given the basic parameters of caliber, weight, core and jacket weight (which self-correct to total bullet weight), material density, and tip width (meplat). The bullet parameters can be calculated with various media density and at various velocities, going beyond the usual, incorrect assumption that the BC will remain the same regardless of speed. The program calculates drag based on both ogive and base shape (some BC programs ignore the base or handle it as a constant), allowing you to compare the same bullet design with boattail or rebated boattail base at different velocities (for example) and with different air densities. This lets you adjust the air density to compensate for changes caused by altitude, barometric pressure, temperature, and relative humidity. You can save all the figures in a file by clicking a button, and print either the saved info as a report, or print the window just as it appears without saving any data. Default values for standard air density and standard velocity are restored with the click of a button, so that it is easy to return to the universally accepted comparision values. The program also calculates kinetic parameters, such as the kinetic energy, momentum, energy density at impact, area of impact, and velocity in miles per hour on a second window. These calculations may be made without affecting the main window bullet design (independent changes to caliber, weight, and velocity are used to display the kinetic values). The media density can include solids and liquids, to establish spin rate for the bullet that would maintain stability firing under water, or into ballistic test materials. A drop-down list of densities suggests values for a wide range of materials, and the user can input any arbitrary value within a broad range. Values are tested and compared to logical limits, so that values too far out of range to be of any logical value are automatically reset to a standard, with a warning notice. The program is useful for subcalibers and airgun pellets as well as military calibers such as the 1-inch cannon and 20mm anti-aircraft projectile (as well as all standard small arms calibers). Ultra low drag designs can be calculated by using 14-S to 20-S ogive radius, and round nose bullets can be entered by using 0.5-S ogive radius. The increased BC achieved with sub-sonic velocity bullets equipped with boattail or rebated boattail bases is immediately apparent. DC-1001 can be run from the CD-ROM (without saving reports) or installed on your hard drive, using the self-starting menu on the CD-ROM. Just put the CD-ROM in your drive, and the menu will appear (if your system has been set to allow auto-start: otherwise, click CDM for CD Menu). No technical expertise is required to calculate the BC and other parameters for any spitzer bullet bullet!